Description: Description for season 1 or the other seasons? Question to ask immediately when we know that the Forest Sector is one which has undergone the most important stylistic changes that occurred between season 1 and season 2. What remains unique to the Sector in all circumstances is its multitude of pathways that wind across the Sector joining on platforms of average size, often supporting towers. But the symbol of the Forest Sector is its million and one trees, either planted on the pathways, or floating above the vast Digital Void, as if suspended from a ceiling by their branches that we cannot see! The pathways are sometimes dead ends, forcing the heroes to jump to flee the monsters. In other cases, they are linked by trunks similar to felled trees on Earth. 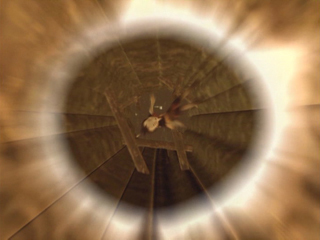 It even happens that the Lyoko Warriors must take tunnels through stumps (episode 16 “Claustrophobia”). In the first season, the trunks appear very old and the soil is made of a very dark green, scattered with brown stains, like the earth on which we walk. In the following seasons, everything changes: trunks seem less ancestral and the soil especially is covered with a particularly bright and dazzling green, not fluorescent but almost. No brown marks on the soil. The light itself changes from the first season to the others. In the first season, a pale light pierces through the trees as background ambience. In the distance, we glimpse an orange sky which gives, when combined, an enjoyable twilight atmosphere but which looks more like at a continental climate, like an old European forest. It should be noted that this is the only Sector, apart from the Ice, where we can find stretches of water. Albeit very dark water, a little like in a pond. We find these small ponds near a tower, where logs allow access to it. 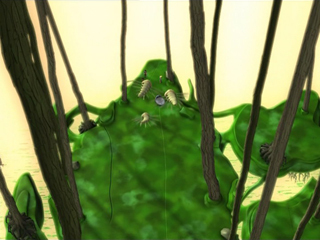 On the Lyoko recreated by Jeremy, another watery place is discovered in episode 68 “Opening Act”. It is made up of an island surrounded by water and accessible by three felled trees. In this island lies another felled log, on which Ulrich's sabers cross with the zweihander. No hero has fallen into the water in this Sector. The number of pathways is much higher in this Sector than in the three others. Sometimes a path splits up into several branches and, finally, they meet up at a single point. In the end, sometimes the heroes, running toward a path, catch a glimpse of the monsters rushing onto another. We find at a place in the Forest a large hollow stump where the heroes, attacked by Krabs, found refuge in episode 13 “Just in Time”. The flattened head of the towering monsters blocked their entry and they could only get their claw in through the crack with the slim hope of reaching a hero! The Forest Sector is the only one where flying is difficult, because of the many trees massed everywhere on the Sector, even above the void! For Hornets, it is enough to be careful and take look at ahead, while for the heroes the task is complex: they must keep a close watch on the trajectory of their vehicle while fighting against monsters. A badly-received laser and the Lyoko Warrior loses control of their vehicle; there's nothing else for it but to jump before smashing into in a trunk! The towering trunks can all the same be used in the heroes' favor. 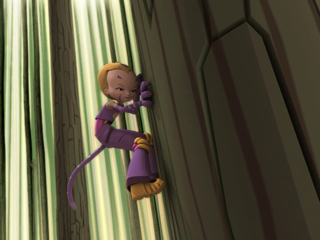 Firstly, they are a great refuge for protecting oneself from lasers (episode 54 “Lyoko Minus One”) but the heroes can also climb or run along them (like Ulrich in episode 47 “Tip-Top Shape”). 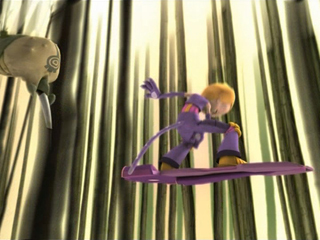 The fallen trees sometimes allow for original fights like the one between Ulrich and William in episode 68 “Opening Act”. A little of originality never hurt. The Forest Replika was very little explored outside of the area in which the tower the Skid docked to was in. 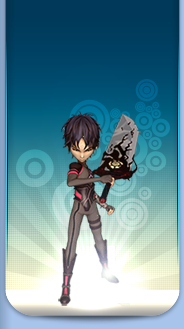 It seemed true to its Lyoko model: a lot of pathways. 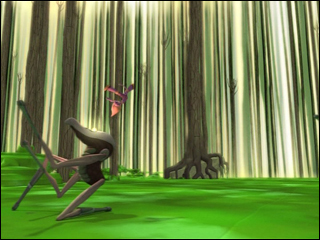 We particularly often find Krabs in the Forest Sector because their big legs and their impressive speed make them able to move rapidly on forest paths and to corner the heroes. 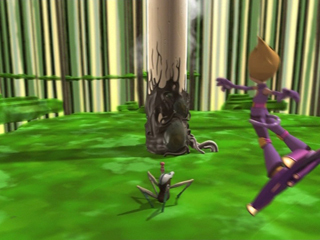 Kankrelats also use the numerous paths to launch offensives from several directions and trap the Lyoko Warriors. One would think that Mantas would have trouble manoeuvring in this Sector. It often happens that Hornets crash against the trees, so Mantas with their wide wingspan could have done the same. Against all odds, the Mantas, William's one primarily, have managed very well in this Sector, giving more priority to flying on the spot than long glides. Their appearance in the Forest remains small in number however. As for William, he is well-off in the forest, like in the other Sectors. He has just to be careful not to stick his sword in a trunk (it should be noted that he doesn't need a trunk to get his sword stuck, the soil is more than enough...). - First virtualization of Aelita with Franz Hopper and rebellion of XANA which led Hopper to turn off the Supercomputer! Events seen in episode 57 “Aelita”. 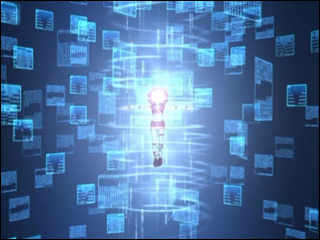 - First virtualization of Odd and Ulrich and Aelita's awakening in “XANA Awakens”. - Yumi's fall into the Digital Sea in episode 6 “Cruel Dilemma”. 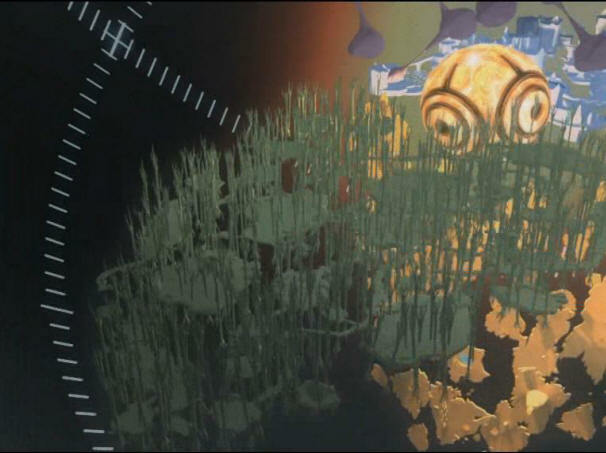 - First materialization of Aelita in episode 25 “Code: Earth”. - First appearance of the Transporter in episode 28 “Unchartered Territory”. 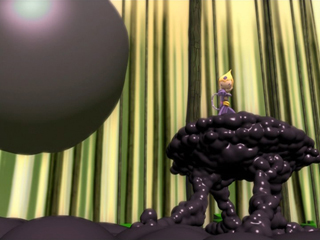 - Jeremy loses control of his Marabounta which invades the Sector in episode 36 “Marabounta”. - Activation of a tower by Franz Hopper in episode 50 “Contact”. 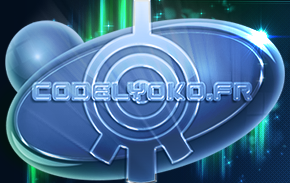 - Destruction of the Sector in episode 54 “Lyoko Minus One”. - Rebirth of the Sector in episode 67 “Double Take”. - First Replika discovered (Forest Replika, so...) in episode 73 “Replika”. - First docking of the Skid to a tower in episode 78 “Lab Rat”. - Destruction of the Replika in episode 79 “Bragging Rights”. 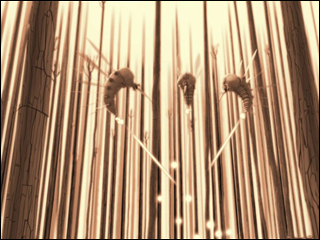 - Final appearance of the Scyphozoa, fight between Ulrich and Aelita and use of the reboot program in episode 90 “Wrong Exposure”.